Black Dog & Leventhal, 9781579129248, 208pp. Christmas compiles the mishaps, the mayhem, the hideous sweaters and inedible fruitcakes, the momentous births and untimely deaths, and the crimes and catastrophes that have taken place on Christmas. Where else would you learn that Werner Erhard send out 62,824 personal greeting cards? Or that 5,000 people dressed as Santa Claus descended on the town of Porto, Portugal to break a world record? Chapters detail all things weird, from traditions to trees, festivities to tidings. The quirky design is illustrated by the Tim Burton-esqe artwork of Lisa K. Weber. 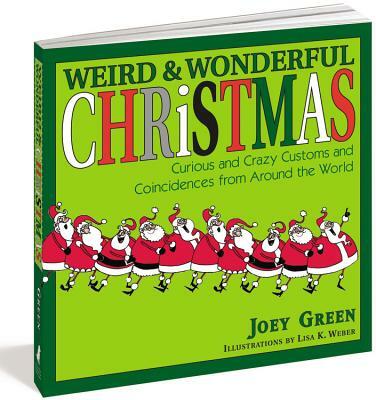 In Christmas, Joey Green has unearthed stockings-full of juicy holiday curiosities for an offbeat look at a heartfelt tradition—and a one-size-fits-all Christmas present no one will ever return! Joey Green is the author of more than 40 books, including How They Met, Cleaning Magic, Amazing Pet Cures and The Mad Scientist Handbook. A native of Miami, Florida, he is a former contributing editor to National Lampoon and a former advertising copywriter at J. Walter Thompson. He lives in Los Angeles with his wife and two daughters.